What’s the difference between an experienced teacher and an excellent teacher? In his book, Visible Learning for Teachers: Maximizing Impact on Learning, John Hattie examines a vast amount of research to try to answer this question. Using the power of meta analysis, which combines data from multiple studies to reach an overall conclusion, he uses the data from over 900 studies to rank the effectiveness of 150 influences on educational achievement. Fair warning: This isn’t a breezy beach read, but I think I can convince you that John Hattie’s book is totally worth the effort. I’ll admit it: I’m a research geek. I spend my Saturday mornings in bed with my iPad, reading articles and chasing down research to the primary sources. Sounds like fun, doesn’t it? For me it is. I do it because I’m naturally curious and it’s unbelievably interesting to me, but also because I like to feel that I have evidence behind what I do with my students. I want to know that all the work I’m doing is actually making a difference. I’m also extremely busy. I’m a district Speech/Language Pathologist and a teacher of speech and hearing handicapped. I support around 50 students in three buildings K-12, so I don’t want to spend time engaging in practices that are not effective. I am always looking for a way to be better. When I first heard about John Hattie’s original 2008 work, Visible Learning: A Synthesis of Over 800 Meta-Analyses Relating to Achievement, I thought, “How is everyone not talking about this? !” It’s a meta, meta analysis that involved hundreds and hundreds of studies and millions of students. John Hattie looked at the effect sizes on essentially everything in educational research and ranked them in order from having significant impact all the way down to having negative impact. By the way, if you’re curious, John Hattie’s rankings and research summaries are available for free, presented in colorful and easy to read graphics. The reason to read John Hattie’s expanded follow-up work, Visible Learning for Teachers, is not so much to read the rankings, although they are in there, and they drive the content of the book. The reason to dig into this book is that John Hattie takes everything that he’s learned from educational research and identified the critical mindsets, dispositions, and behaviors that make excellent teachers, along with the practices that make student learning visible in schools. The book is divided into to three main sections that represent the big takeaway ideas from the research in his original book. Each section provides checklists of behaviors that produce evidence of learning. Can identify the most important ways in which to represent the subject that they teach. Are proficient at creating an optimal classroom climate for learning. Monitor learning and provide feedback. Believe that all students can reach the success criteria. Influence surface and deep student outcomes. In one compelling exercise, Hattie lists 30 influences and asks teachers to guess the impact of these influences on student achievement (high, medium, or low). This prompts teachers to examine what we think we know compared to information from a vast amount of educational research (the answers are in the back of the book). For example, I know some teachers that argue passionately for retaining failing students as a way to boost their academic performance. They may be surprised by what the research says. (Spoiler alert! Not only does retention not boost academic outcomes, but it actually has a negative outcome.) In this section Hattie is priming the pump for for deeper introspection and self-reflection. This section is really the meat of the book. In it, Hattie takes teachers through the process of planning a lesson: selecting the success criteria, choosing a method of formative assessment, and interpreting the results to drive next steps. He doesn’t suggest a curriculum or a particular style of lesson planning, but instead takes teachers, administrators, and data teams through a thought process that leads to the formation of lessons with clear targets for all students, a means for rapid formative assessment, and a mechanism to evaluate if appropriate learning occurred or not (and if it didn’t, what is the next corrective step). This section challenges teachers to think more like diagnosticians. As a therapist, this way of thinking makes sense to me, but I think it would be particularly helpful with teachers who are struggling with differentiated instruction and providing response to intervention (RTI) services. Believe that their fundamental task is to evaluate the effect of their teaching on students’ learning and achievement. Believe that success and failure in student learning is about what they, the teacher, did or did not do. Want to talk more about learning than teaching. See assessment as feedback about their impact as a teacher. Engage in dialogue not monologue. Believe that it is their role to develop positive relationships in classrooms and staffrooms. Inform all about the language of learning. These mind frames had a profound impact on me. I had a sense that I was making an impact on my students, but sensing it wasn’t good enough. I knew I needed a way to measure my impact objectively. This led me down a path of revising my goal setting and data collection systems to give myself objective data about my effect on my students’ learning. In each section, Hattie provides checklists and explanations of observable behaviors that teachers, administrators, and schools can look at that demonstrate practices that lead to visible learning in schools, and in students. He also has them in the appendix of the book. These checklists can help you be intentional in using practices that have been shown to be effective in impacting student learning. Personally, I’ve used the research findings in this book to make a significant difference in what I do with my students. Now my students understand what their learning objectives are, and they can track their progress toward their goals. I’ve shown my students how to embrace challenge and convinced them that the work needs to be “a little bit hard” for their brains to grow. It’s been so powerful for students to understand and figure out what helps them, or what gets in the way of their learning. I give them feedback about their learning, and they can see their own progress. Part of my job is to get students to engage in tasks that are difficult for them. If it were easy for them, they wouldn’t be on my caseload! Before, students would get frustrated and shut down during a difficult task. Now they realize the struggle is part of the process, and they use problem solving strategies and find motivation in their progress. I use feedback and assessment data to plan my sessions with students. Using the feedback to drive instruction has made planning much easier and faster and the results have been much more effective. I work in a district with a very high poverty rate. It can be easy to see the challenges that come with poverty as insurmountable, but the research says otherwise. John Hattie wants teachers to see themselves as “agents of change.” The research shows that teachers have tremendous impact despite some of the challenges that come with working with children in poverty or children with disabilities. That impact comes with high expectations and responsive teaching that uses feedback from students to drive instruction. Visible Learning is an excellent starting point for teachers to engage with research, despite there being some issues with the meta analysis approach he deploys, but so much of the book is about very practical methods to teach effectively and helps teachers become evidence informed. My tip would be grab a hold of Hattie’s ‘The Science of Learning’ – it is a must read for every teacher. Enjoy – you teacher dorks, reading educational research on your summer vacation! Remember us down here in the southern hemisphere heading into our winter term. Lindsay, thanks so much for sharing these links! I would definitely be curious to hear more thoughts on these criticisms. What do you think personally? In as much as he is a talented storyteller I find him quite compelling. However as a trained and qualified teacher-librarian I find his views on the role of the school library antiquated. 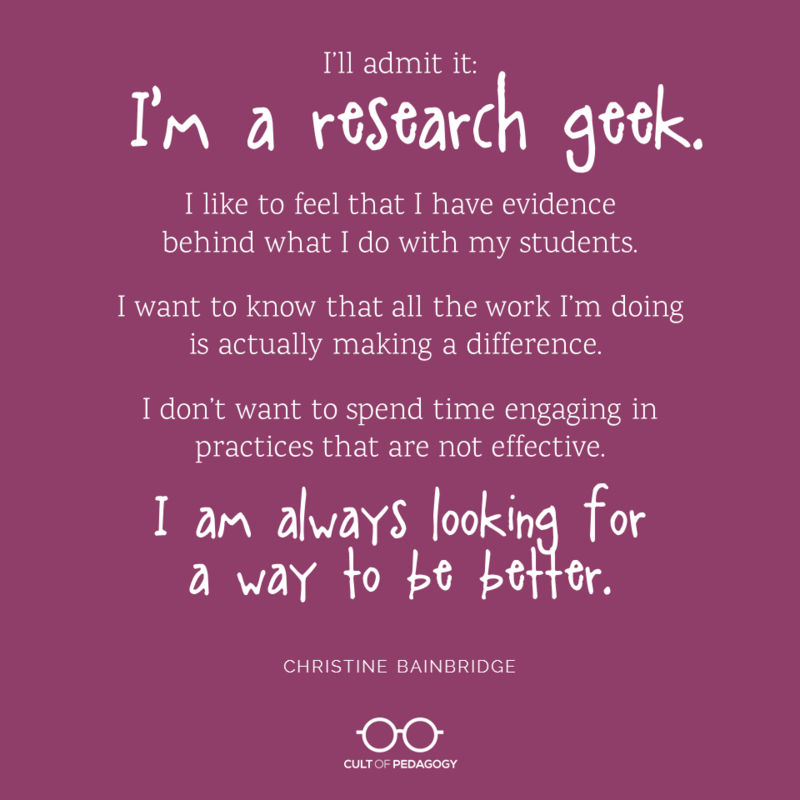 I’m a research geek, too! In 2005, I began developing training for teachers of English Language Learners that was based in the research of Robert Marzano. It has been well-received and extremely well-reviewed. John Hattie’s work has caused me to go deeper – to look carefully at the mission of Educational Training Specialists https://training4teachers.com. Our understanding of teacher mindframes and specific effect sizes of common practices has grown. Our training sessions now reflect even more of aspects of the realm of best practice. Love your post! I haven’t had a chance to read the book, but I did download the 250 influences, and after reading through, I doubt that I will purchase the book because most of the results of the “meta-analysis” simply don’t ring true. I have 15 years of teaching from university/jr. college, middle school (ELA) and k-5, mainly 4th/5th. I feel like John Hattie is Charlotte Danielson all over again; good scholarship has been appropriated to mandate bad policies. In Anchorage, Alaska Hattie is being used as the reason all elementary teachers must now follow 90-minute Reading First direct-instruction scripts for reading (regardless of student needs, teacher track record, or school test scores), remove small group teaching from our classrooms, turn teaching of science & social studies over to our music teacher and parent volunteers, and group students by thrice-yearly standardized testing to determine whether they get to access science or social studies or just get more scripted reading “instruction”. Hattie’s work is also being used to justify removing teachers’ ability to determine whether students need reteaching in math or reading, since we’re told the effect size of math remediation is smaller than that of reading. If I were John Hattie, I’d be suing for defamation. Thank you for your review, Christine, did you read any of the meta-analyses Hattie used? I’m collecting peer reviews of Hattie’s work here and also reading the background studies. I am very surprised at what i’m finding. A good example is ‘welfare policies’. Hattie reports it has a negative effect size from one study. I’ve read the study and am dumbfounded! My school started trying to use Hattie’s work to inform “evidence” based practices so I decided to read his work, felt uneasy about it all, and did further researching of my own. Well, his whole approach is anything but proper research has some significant flaws in it to the point where, as a budding research geek myself, would render it near useless at worst and only come near with extreme caution at best in terms of looking at it as anything other than inspirational and an extremely basic starting point of what you *could* do, not what you should do. In short, it’s a useless fad that should die out as soon as possible and your blog has lost a little credibility for me personally. If you’re wondering what I’m talking about, just google “John Hattie Critiques” and take a look at top researchers from the likes of John Hopkins, Durham, McGill,etc. that absolutely destroy his whole program. Hi Frank! Because a lot of educators have said their practice has really improved by following Hattie’s work, we wanted to share this review by Christine, who also found Hattie’s work to be valuable. But we don’t want to present just one side and certainly want to be aware of the concerns that others have. If you have the time and wouldn’t mind either going into a little more detail about the criticism that’s out there, or perhaps provide specific links to resources that you have access to that you think are particularly relevant for us to learn from, that would be great. This would also help other readers of this particular review become more aware of the criticisms as well. Thanks again for sharing your perspective.